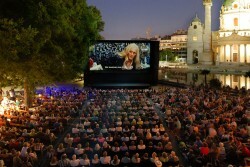 Every summer in Vienna, numerous open-air cinemas show films on a wide range of topics. Admission is free of charge at the Musical Film Festival at City Hall, the “Cinema under the Stars” on Karlsplatz and at the wandering "Volxkino". Original versions with English or German subtitles can often be seen. At the annual Music Film Festival, Vienna’s City Hall Square becomes a meeting point for music lovers and night owls - with free film screenings and culinary delicacies. The range of music films shown covers everything from opera to pop.